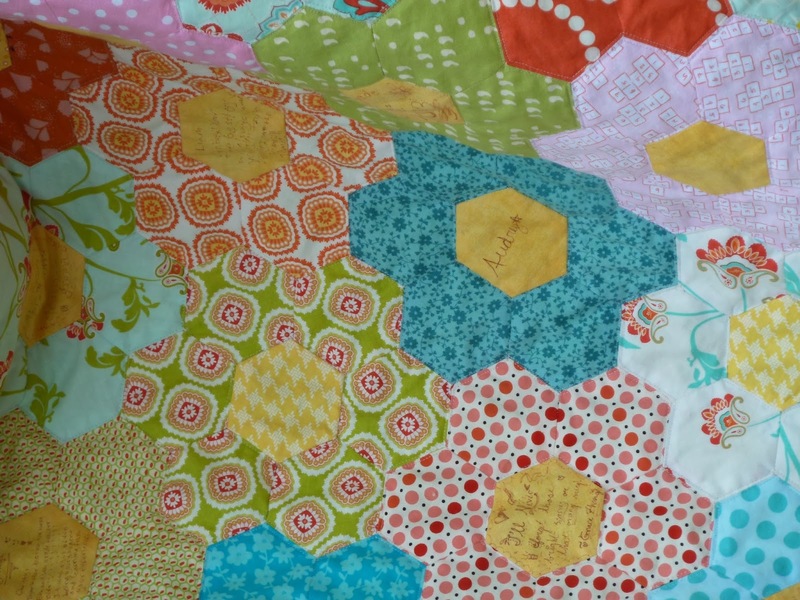 It's hard to believe it's time for another Blogger's Quilt Festival. 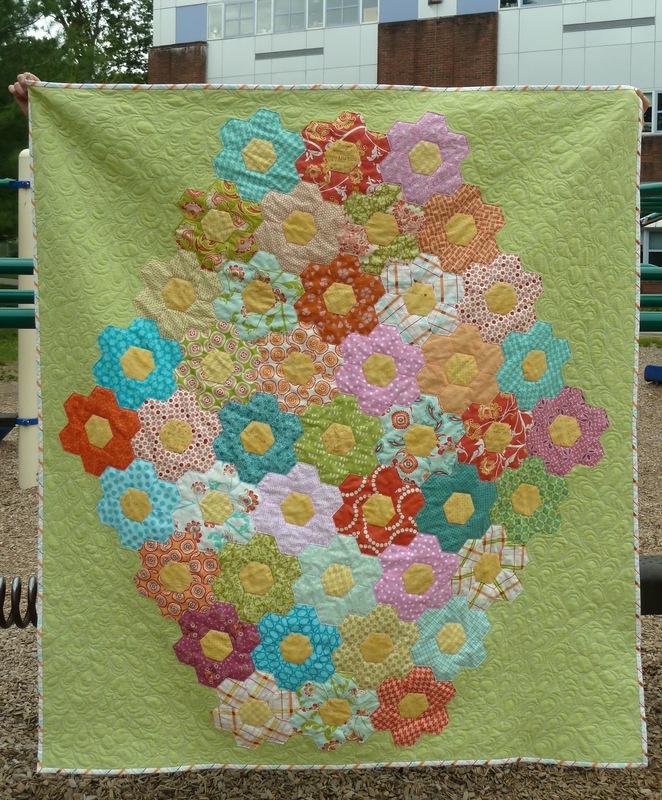 Choosing a quilt to share made me realize how little quilting I've done this year but it gives me another chance to show off Christy's Garden, one of my absolute favorite projects. Over the course of the spring we scheduled several sessions for the kids to come over after school and work on their project. 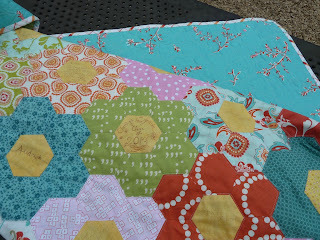 I precut the hexagons and let the kids pick which fabric to use for their flower. Each person had to make at least one printed petal and a solid yellow center which they signed. For many of them this was a challenge but focused on the goal of making something special for their teacher they stuck with it and persevered. 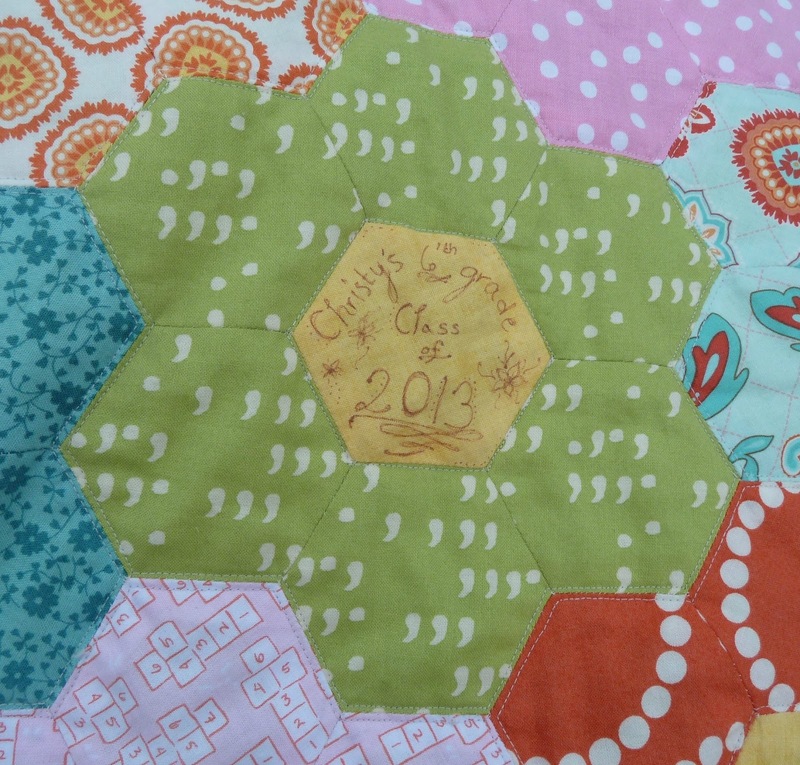 Almost everyone made all 7 hexagons for their flower and many of the kids went on to stitch them together. Once the kids had finished their flowers I invited the parents over to help me with assembling all the flowers together (or at least keep me company while I did it:-) Our school is very focused on community and this truly was a project that embraced that philosophy. With graduation rapidly approaching I quilted this and got the binding on so the kids could present it to their teacher. They were all so excited to point out each of their flowers and tell her about making it. The best part is when I'm volunteering at the junior high and see the kids from this class they all stop to talk to me and several have asked if we can make another quilt. The next generation of quilters is here!!! Start early, it will take longer than you think!!! Have all of your materials ready in advance. I bought paper hexagon templates and precut all of the fabrics. It also helps to have pre-threaded needles with knotted ends for kids to use to tack down their hexagons. They'll have plenty of chances to learn to thread a needle and it'll let you quickly get everyone started making their flower. I also gave each kid a binder clip to hold their first side down. If possible, start by teaching a small group first. I did our first session with just Audrey's close friends. That way they were able to help the kids who were struggling and needed some extra help. Stay organized. I gave each person a ziplock bag with their name on it to keep all their supplies in one place. Rather than sending pieces home and risking them never coming back I kept everything and scheduled more sessions. Also keep a class list to check off who has made their flowers and also to make sure that all the finished flowers make it in to the final quilt. Be sure to check out more awesome quilts at the Blogger's Quilt Festival!!! It's wonderful and I know she'll treasure it. Such a pretty quilt, and I love the story behind it. You were very generous with your time and your home to make such a lovely keepsake. It's wonderful that the kids want to make another one someday. Wonderful! Any project that has children's work in it is instantly fabulous! Great job. Lovely. This is a beautiful quilt!